The Office of Government Ethics (OGE) has been under assault since Trump won the election with the help of Russian hackers and FBI director Comey. Two weeks ago the Republican dominated House made a sneak play to eliminate the office, but had to give up the idea after a massive bipartisan response condemning the bill. Trump knows that he's going to be violating numerous rules and even the Constitution, and that it's imperative he doesn't have a government watchdog snapping at his heels. So the Trump transition team is taking another tack and is going after the OGE director Walter Shaub Jr., for publicly raising questions about him and the people he's chosen for his Cabinet. On the same day of Trump's first press conference, where he addressed his potential business conflicts, Shaub gave a speech at the Brookings Institution explaining that Trump's action was meaningless. 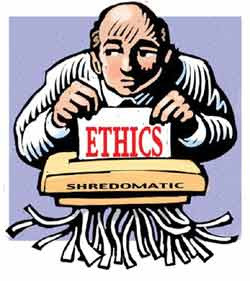 Then Shaub sent a letter to Senate Democrats warning them that all the nominees hadn't completed their ethics review. Missing was required financial disclosures. Just like Trump's refusal to release his tax information. In retaliation, Republicans threatened Shaub and have ordered him to appear before a committee before the end of the month. "The Oversight Committee has not held one hearing, conducted one interview, or obtained one document about President-elect Donald Trump's massive global entanglements. "Yet this committee is now apparently rushing to launch an investigation of the key government official for warning against the risks caused by President-elect Donald Trump's current plans." There's no doubt Trump's team is on a mission to eliminate any ethical restraints that will cause him problems in the next four years.